In early March, the Division of Juvenile Justice (DJJ) Pine Grove Camp Community Service Crew, lead by Youth Correctional Counselor Tom Menley traveled to Ione in order to assist with the Howard Park Playground clean-up project. The service crew cleaned out the used woodchips that had been surrounding the play structure. These woodchips were then re-used by being spread throughout the park, decorating the walkways and setting areas. 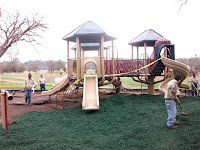 Once the task of removing the used woodchips was complete, the service crew then assisted in spreading rubber around the play structure. This entire project took a couple of days to complete, but the guys on the service crew said they really liked working on this project.